Being the most popular type of game in both online and brick-and-mortar casinos, slots are surrounded by numerous myths, superstitious players often fall prey to. It is difficult to explain why that is. It is probably inexperienced players, who have helped perpetuate a large portion of these misconceptions simply because they are not acquainted with how slots actually work. 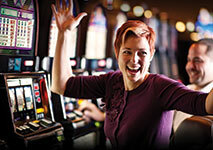 A great number of paid winning systems for slots have emerged in recent years. These rarely work causing the players who have actually bought them to grow disillusioned, further perpetuating the myths, associated with slots. In the following article, we shall attempt to lay to rest the most widespread myths surrounding slots and provide reasonable explanations as to why these notions are false. Anyone who has ever spun the reels may have noticed an interesting tendency of certain slots going on hot streaks and offering consistent payouts for specific periods of time, which are then followed by prolonged cold streaks, during which the game hardly pays anything at all. It is precisely this tendency which has birthed the misconception that gambling venues and online casino operators pre-program the slots they offer to affect their payouts. Hot and cold streaks can indeed occur over shorter periods of time whenever there is a deviation from what is likely to statistically happen. Note that when it comes to the law of averages, a “short” period of time often spans several years. Inexperienced players should above all remember that the outcomes of the spins would eventually even out to the slot’s average player return percentage over the long term. The truth of the matter is that, yes, slots are indeed preprogrammed… by software developers in order to ensure each individual spin of the reels is completely random and is not affected by preceding or subsequent spins. There is a widespread misconception among some players that a slot, which has just paid a gargantuan progressive jackpot, should not be played immediately after because it goes “tight”. While there is some weird logic behind this, the idea of personifying slot machines is laughable, to say the least. Some may say the slot machine is trying to counterbalance paying the huge jackpot and get back to its average payout percentage by rendering less frequent wins. However, there is hardly an ounce of truth to one such statement. Neither slots, nor roulette wheels, nor dice have memory. Hence, a slot cannot “remember” it has just awarded a life-changing amount of money to someone. In fact, slots do not even know somebody has just collected a jackpot. The game’s RNG continues to spew its long sequences of numbers ensuring each and every spin is random. Realistically speaking, you may hit the jackpot on the very next day after somebody else has collected it. Anyone who has ever played slots, especially in landbased casinos, has probably witnessed the following situation first hand. A given player spins the reels at a particular machine for hours on end without much success. Then, they decide to take a break and grab something to eat or visit the restroom, but another person jumps in, plays the same slot, and hits the massive jackpot. A superstitious player is likely to accuse the second person of “stealing” their jackpot – should they had put off their lunch break for a couple of minutes, they would have collected the prize. Although it can certainly feel this way, no one can potentially “steal” your jackpot because the slot’s RNG is tirelessly at work, producing its number sequences even when the machine is idle and there is no one there to press the Spin button. The winning symbols that land the jackpot have been produced at the very split second the second player has hit the button. The likelihood of you hitting the button at the exact same time as the jackpot winner is almost nonexistent. This is yet another misconception that evokes nothing but laughter among experienced slot players. Both online and landbased casinos treat their players to various promotions and loyalty incentives which aim at rewarding loyal patrons, not punishing them. Whether or not you are using free spins, bonus credits or loyalty points is completely irrelevant to the slot (which, by the way, has no way of knowing how you fund your play) and does nothing to negatively affect your chances of landing a winning combination. If anything, using bonus credits and loyalty points/cards will add more value to your gameplay. This myth has more to do with spinning the reels in brick-and-mortar gambling establishments but is equally nonsensical. According to some players, casinos are strategically positioning the slots with the highest payout percentages at the front of the venue so that they can lure more players. At first, glance this makes sense. This may have been the case years ago when slots were still a novelty in landbased venues, so the casinos were trying to attract players and introduce them to this type of game. Nowadays, when slots are already the most popular casino game in the world, floor managers have adopted the practice of grouping the machines according to their chip denomination and type. But wait, there is another variation of this myth, which states that casino floor managers are actually trying to “hide” their best-paying machines at the back of the venue. This also does not make sense. If anything, casino managers would profit more if they position the highest-paying machines in a busier section of the venue, so that when players see someone is winning, they would hop in and invest some of their funds in that particular game. Now, this is an interesting notion which comes in several different variations. There is a widespread belief among superstitious players that progressive slots are more likely to hit over the weekends as compared to weekdays. Interestingly enough, there is an ounce of truth to one such statement because most recreational players are at work on weekdays. 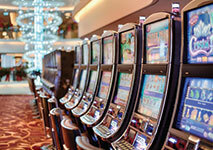 Indeed, more jackpots are won over the weekends simply because more people visit the casinos and play the games. There may be more winners over the weekends but the same applies to the number of losers as well. Another variation of this myth is that slot machines tend to pay out more generously during the slow periods when there are hardly any customers on the floor. Even if you are the only player on the entire floor, you would still have the same chances of winning because neither the slots, nor their RNGs know what time of day (or week) is it or how many people are currently visiting the casino. This must be one of the most ludicrous notions ever. Believe it or not, there are some superstitious slot players, who actually think, brace yourselves for it, that the temperature of the coins they insert into the machine affects the outcome and their chances of winning. This idea is so bizarre that one cannot help but wonder how anyone could possibly come up with it. Interestingly enough, one such person would hold the coins in their palm to warm them up before inserting them into the slit because slot machines apparently are averse to cold coins and would avenge themselves on players by adjusting their payouts accordingly. We have said it before and will say it again – whether you win or lose depends solely on the slot’s Random Number Generator. Anyone who has ever played slots online has probably noticed the Autoplay feature and knows what its purpose is. And no, its purpose is not decreasing your chances of turning a profit. This myth sort of resembles the notion of landbased players that pulling the slot’s lever boosts their chances of winning as opposed to pressing the Spin button. Both myths are equally nonsensical, however. First of all, the Autoplay feature is there to further the convenience of players who prefer a more dynamic gameplay and wish to speed up their game. Thus, the Autoplay feature may lead to losing more money because you play at a faster pace, but using it by no means affects the payout percentages of the slot. The same applies in full force to the lever/button notion – the RNGs decide on the outcome of the spins and have no way of knowing whether a given player is pulling the lever or is pressing the button. Some recreational players assume that the personnel in landbased gambling venues deliberately messes with the slot machines to make them looser during slow hours or tighter on weekends when everyone is off work. Now, this is not impossible to happen. One viable way of altering a slot’s payout percentage is by simply replacing its motherboard chip with a different chip, pre-programmed with a lower RTP. However, it takes time for one such switch to happen, not to mention it is deemed an illegal practice. And casino operators know this very well. Would anyone risk incurring hefty fines, having their license suspended and even spending some time behind bars just to reduce players’ chances of winning for a couple of hours on a Sunday? We think not. If anything, players are recommended to experiment with different slots, be it online or offline. So, no, the notion of playing the same slot for hours on end because it will eventually reward you with a hefty payout is completely false. Nobody is ever due to win. Of course, common sense dictates that the longer you play, the greater your chances of winning a hefty prize because sooner or later, the law of averages would prevail and one of the RNG’s long sequences of random numbers would eventually get converted into an outcome that renders a huge pay. But consider this – the longer the time you spend on any given slot, the more you will likely lose overall, because the casino practically collects a small percentage of each single wager you make. Because of this, it would be better to diversify your gaming session a bit and consider switching to a looser game, with lower variance.